Modern, seasonal French fare is on display at this elegant King West bistro and pâtisserie. Lunch & Dinner Mon.-Sat., Brunch Sat.-Sun. : Colette Grand Café is a bistro and French pâtisserie in one. Enter through the side access where macaron, croissants and tarts are on display or arrive at the front to the reception area. It’s a large space with varying design, from white marble tables to plush blue furniture. The meal starts with a complimentary bread service of tangy baguette and grainy bread slices, followed by an amuse-bouche, spiced halibut in a lettuce leaf. French onion soup has a meaty broth and crispy onions adorning the top. 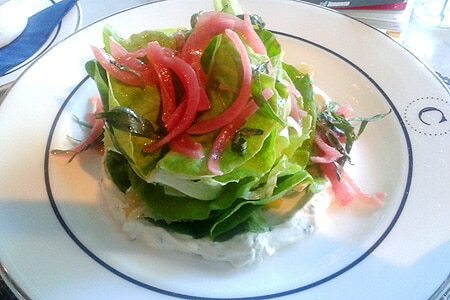 The Bibb leaf salad is masterful with layers of delicate leaves, pickled onions, mustard vinaigrette and creamy cheese generously spread on the bottom of the plate. We also recommend the hummus and caponata, a bowl of hummus finished with stewed tomatoes and eggplant. Main dishes, like the halibut, are just as intriguing. Colette’s springtime version involves a green broth, sweet honey mussels and nutty spelt berries. The wine list includes varieties from France primarily, but the odd Ontario wine is also available. Guests may opt for one of the blended juices or sodas, too.